Freda Reiter, Nixon’s chief of staff H.R. 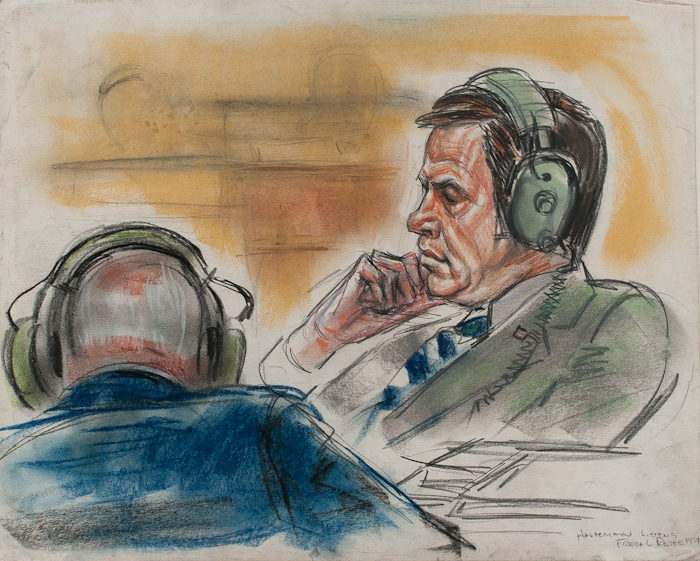 Haldeman listens to covert White House tapes during his trial for Watergate-related crimes, October 1974. Pastel drawing, 17″ x 14″. The resignation of President Richard M. Nixon in August 1974, and the prison sentences issued to many of his top aides in 1975, were vindications for those who hoped to see deception and criminality purged from the White House. As our current president faces similar allegations, Watergate has returned to the popular consciousness. Now on view at Gallery 98, vintage sketches by renowned courtroom artist Freda L. Reiter (1919–86) let us relive the drama of that moment. Freda Reiter, Richard Nixon in conversation with Charles Colson (detail). Recreation of a taped 1973 conversation used as evidence in a Watergate trial, 1974. Pastel on paper, 17″ x 14″. Today, it’s hacked e-mails. Back then, it was the bugging of the Democratic National Committee office at the Watergate complex. As investigations into the burglary exposed crimes and “dirty tricks” planned at the highest levels of the Nixon administration, “Watergate” became (as Jon Meacham writes in the New York Times this week) “a catchall term for the White House’s involvement in political espionage, break-ins and subsequent cover-ups.” The Senate hearings and court trials in which the story played out received an unprecedented amount of media coverage, aided by sketch artists like Reiter. 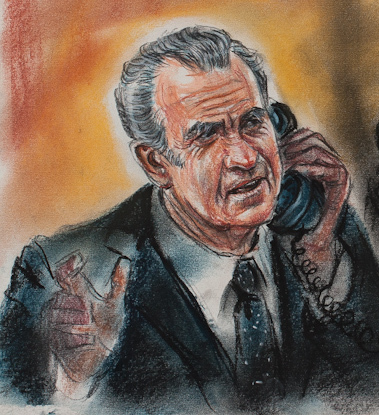 Gallery 98 currently offers 24 pastel drawings done by Reiter for ABC-TV’s coverage of the Watergate scandal. 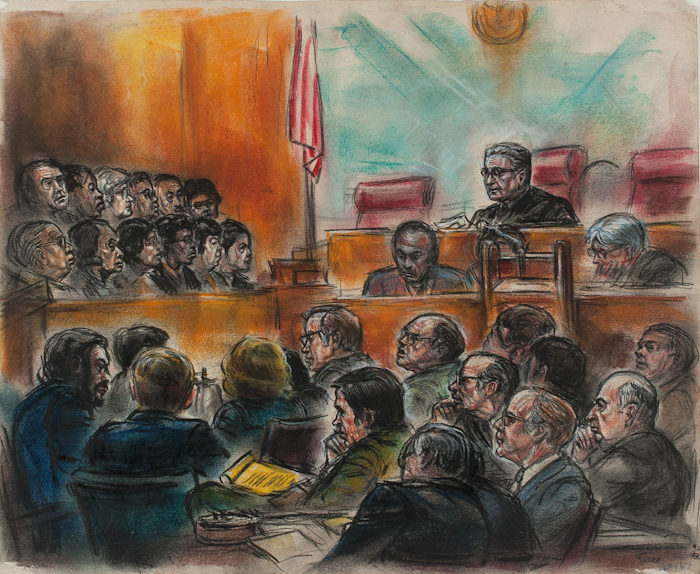 Watergate marked a high point for the practice of courtroom illustration, which would decline as US courtrooms began to permit cameras. Reiter was one of the best artists covering the story. Her excellent portraits and courtroom scenes captured the drama of the moment with carefully observed gestures and evocative bursts of color. Despite their long history, courtroom drawings and other journalistic illustration have rarely entered the world of fine art. Now, in the wake of Pop art, and the blurring of lines between fine arts and mass media, the work of artists like Reiter can be better appreciated both as aesthetic achievements and as part of the historical record.